Short on space or just prefer to keep hot tubbing cozy? Then you might be in the market for a 2 person spa. Most smaller models can fit indoors or outdoors, as their depth allows them to fit through doorways. Smaller spas also fit well on decks, in sun rooms or tiny backyards. Being smaller, these hot tubs tend to use less energy than the large size spas. 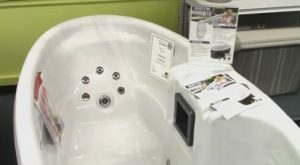 First, you will want to consider if you want a plug and play or a standard 240 volt hot tub. The benefit to the plug and play is you just need a dedicated 120 volt, 15 amp power outlet. These are standard in most homes, so you don’t need any special electrical installation. You can fill the hot tub with a garden hose, so you don’t need any special plumbing either. The problem with many plug and play spas is that they don’t come with a heater – but just rely on the heat generated by the pumps to warm the water. If you are putting the spa outside in a northern climate, then you definitely want to get a tub with a heater. With plug and plays, you can’t run the heater and spa pump at the same time. Many plug and play spas can be converted to a 240 volt (electrician required). Other options you may want are an ozone generator to help keep your spa water clean; a hard cover – preferably a lockable one; and some well-placed hydrotherapy jets. It is also wise to choose from a spa manufacturer that has been around a long time – so you can count on the warranty being serviced. The best deal we have found on the internet on a 2 person spa is the Silver Star by QCA, available at Hot Tub Outpost. 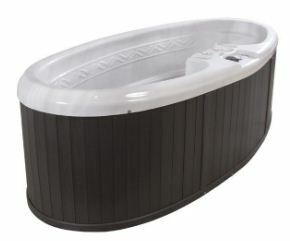 Compared to other 2 person plug and play spas, the Silver Star has what you need for hydrotherapy indoors or outdoors. The spa measures 91” x 42” x 29” and is 120V/15 A. The 15’ GFCI protected cord is included. Regularly priced at $4,390, this spa is on sale for under $3000. Hot Tub Outpost is also throwing in free shipping, a free ozonator, free stainless steel jet upgrade and a free upgraded hard cover. This is probably worth at least $700 that you can get at no additional cost with the current promotion. Unlike many plug and plays, the Silver Star comes with a 1 KW heater. It has a quiet operating, low cost circulation speed – 1.5 HP continuous duty spa pump. It is outfitted with 16 stainless steel jets: 2 mid back, 10 upper back, 2 lower back and 2 foot jets. It features a Weather Guard maintenance free cabinet and a Lucite-Xtra acrylic shell with Dura-Bond 4 layer strengthening process. This hot tub has digital topside controls, a 12 volt light, a built in filter and inline chemical feeder. The Silver Star spa is made in the USA by QCA Spas – one of the oldest U.S. hot tub manufacturers. This is definitely our current pick for hot tub bargains and we don’t think you will find a better deal on a 2 person plug and play anywhere. Learn more about the Silver Star Spa sale.